Exceeding the expectations of analysts, Reliance’s Jio Phone has emerged as the leader in the domestic handset market, cornering 21 per cent of it in 2018. About 290 million handsets were sold last year. This is the first time an Indian brand has ended a year at the top of the charts. 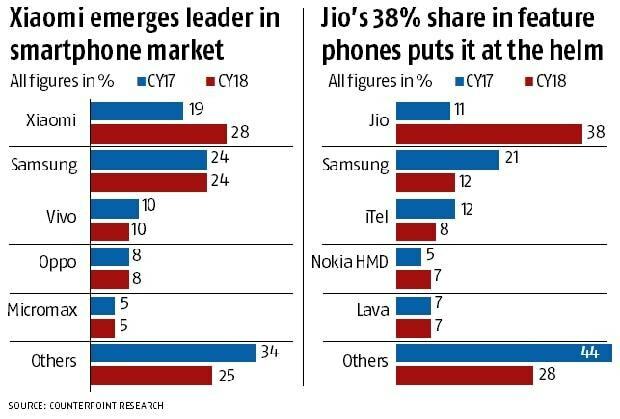 Data from Counterpoint Research shows, in 2018 Jio captured 38 per cent of the feature phone market. This catapulted it to the top spot in the overall handset market. The strategy leading to its stunning growth owes a debt of Jio’s performance in the telecom services market. Since its entry into the handsets segment in late-2017, Jio Phone — like the telecom service provider — altered the dynamics of the market with frequent innovations. 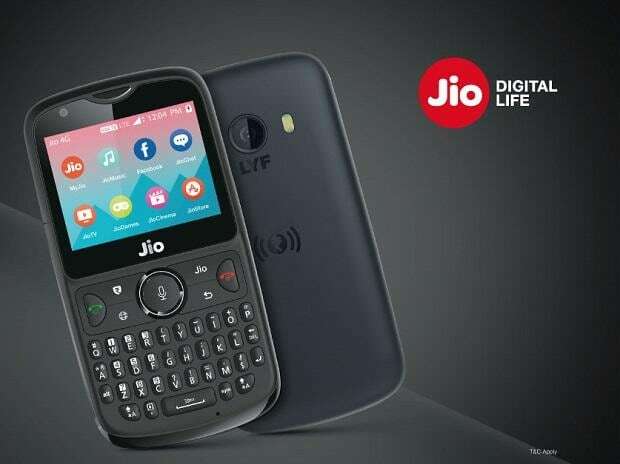 While R-Jio broke barriers by aggressively slashing data rates and making internet services accessible to millions of consumers, Jio Phones disrupted the otherwise mundane feature phones market by introducing a new category — smart feature phones. R-Jio-Jio Phone team not only aided each other’s growth but also made calling rates cheaper. This has attracted users to opt for a Jio Phone as a secondary device. Tarun Pathak, associate director, Counterpoint Research, said compelling value proposition compared to normal 2G feature phones offered by Jio has helped it achieve the feat in just a over year. Jio’s emergence in the handset space has also brought good news for the feature phones market that traditionally caters to price-conscious and rural consumers. The feature phones market, as a result, has grown faster than the smartphone market in 2018. While, smartphone volume surged 10 per cent last year, feature phones shipments rose 11 per cent. “This highlights that while India is a fast-growing smartphone market, feature phones remain relevant for a large section of the population,” said Pathak. The highly fragmented feature phone market, with over 500 brands struggling survive, has seen significant consolidation is 2018. Now, the top five players, Jio, Samsung, ITel, Nokia HMD, and Lava, have 72 per cent of the market. Xiaomi has for the first time emerged as the leader in the smartphone market for a full calendar year. While the Chinese major has been at the top for the past six quarters, it is in 2018 that Xiaomi beat Samsung by capturing a 28 per cent share of the market. Samsung’s market share stood at 24 per cent, same as in 2017. The next three largest players — Vivo, Oppo and Micromax — also maintained the same market share in 2018, at 10 per cent, 8 per cent and 5 per cent, respectively. About 135 million smartphones were sold in 2018 — beating all previous records. India is already the second-largest smartphone market in the world after China. Poor penetration of smart devices continues to aid its growth, said analysts. While, India has over 430 million smartphone users, according to estimates, that accounts for only 45 per cent of the potential market for smartphones.